For the lucky ones among us, bad news is an infrequent visitor that comes without warning but leaves as quickly as it arrives. For others, like March’s Survivor of the Month, Pam Cowart, tragedy arrives like the familiar refrain to a song that she had heard many times before. The story of Pam’s fight against breast cancer is a difficult one to tell, as it begins many years before her diagnosis. It is a story of an anguish that can only come by losing five family members to this terrible illness, and the story of the mettle that it takes to turn that pain into positive source of inspiration. It is the story of the tribulations that many survivors must endure, and the story of an unending hope that has driven one woman to make a lasting impact in the fight against breast cancer. But above all, it is a story of courage. It is common that the fight against cancer carries with it a gnashing coil of conflicting experiences; one minute there is fear and the next there is disbelief, one moment rage and another redemption. Yet in this maelstrom of thoughts and emotions, Pam dug deep inside to find the courage and toughness that binds survivors together forever. “I suppose I could sit around and throw myself a pity party, but what good would that do?” Given her family medical history, Pam decided to take an aggressive approach to her treatment, and opted to have a bilateral mastectomy. To say that Pam’s fight was difficult is to understate, but sometimes there are simply no words to describe the courage that it takes to endure nine months of chemotherapy and 36 separate radiation treatments. A critical milestone on the journey to recovery is often finding a way to connect and move forward. Faith, family, and friends are common places where survivors turn for support. This was no different for Pam. During times of frustration or toil, Pam learned to lean on those closest to her, particularly her two daughters, for support. Pam, like many others, has also found support in the connections that she has made with Susan G. Komen. “In 2005, 3 years after my bilateral mastectomy and recovery, my life took a dramatic change. I decided to walk the Susan G. Komen 3-Day Atlanta walk. It was a walk for my family and friends who had traveled the path before me and those traveling the path with me. This walk became my deliverance!” Pam has gone on to lead a team in each year of Coastal Georgia Komen’s existence, and this year “Team Pam” will walk in its sixth Race for the Cure. Since her diagnosis, Pam has channeled the hardships of her journey into a passion that drives her to this day. The impact that she has had on the Coastal Georgia community, like Pam herself, has been nothing short of inspiring. 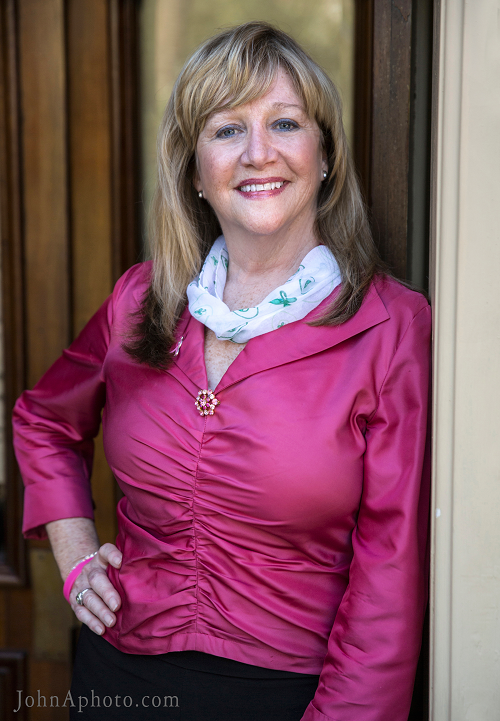 “As a founding member of the Susan G. Komen Coastal Georgia Affiliate, I (have) served on the Board the first 6 years of its existence. I embraced the role of being a proactive advocate to lobby elected officials in Washington, D.C. and Atlanta about the importance of early detection, access to care, nurse navigators, and research.” In addition to this outreach, Pam also served as the Survivor Co-Chair for the race in Savannah for two years and was recognized with the New Balance Survivor/Volunteer award for her work with survivors.